Spotify claims that they can’t pay us because they don’t know who to pay. Sounds like BS. But apparently, there’s some truth to it. Well, not exactly who to pay, but what percentage of a song goes to Jane and what percentage goes to Joe. And very often there's also a Tania a Louie and a Mike. The whole pie must add up to exactly 100% and all publishers and PRO affiliates must report the same information or else…the royalties for your song go into a Black Box. As if it’s not hard enough to make a living with digital royalty rates as low as they are. So if you think you're at least getting paid on 10% of your song until it (hopefully) goes up to the 20% you demanded, you're mistaken. At the most recent SONA Salon peermusic’s Kathy Spanberger concurred that this is indeed one of her biggest problems when trying to get her writers paid. She said that some split disputes go on for years. Some never get resolved! She suggests that songwriters sign a simple document at the beginning of a session agreeing on the splits in advance. But who wants to sign a pre-nup before SongSex? I don’t. What a vibe buster. And what is the subtext? 1- Hey, I don’t trust you. Can you sign this? 2- Hey, just in case you try to rip me off, can you sign this? 3- Hey, you might try to change the rules after the game, so can you sign this??? Uncomfortable, Suspicious. Paranoid. Can't we just get it on! We have to accept that sh*t has changed. Royalty delivery systems are complicated and there are more titles and more stakeholders than ever before. And it's not just the significant discrepancies that wind up in the Black Box. Hitmaker Desmond Child says of writing in a 3-some (which has to be divided as such: 33.3 / 33.3 / 33.4) “I’ve seen writers go to war over that .1%.” I thought he was kidding. He wasn’t. Even when relationships are friendly, if Traci graciously allocates the .1% to Eric (unbeknownst to Eric), and Eric allocates it to Traci, (unbeknownst to Traci)—bam. Black Box. The data doesn’t match. So if you're a 3-some, draw straws for the .1%. Desmond says it’s imperative that we change our habits. He says we should think of it as songwriter hygiene or etiquette. Oh, I can hear the grumblings…We go home and feel disenfranchised because we contributed so much more than our co-writer. Ya know, it’s hard to weigh a contribution. Who’s to say a hook is worth more than the verse that allows the hook to make sense? Why not even splits all around? It balances out in the end of a career. You lost a little here...got more than you deserved there. And if someone consistently doesn't carry their weight, don't work with them any more. Perhaps a few years from now we’ll get to the point where signing a doc is just a preliminary necessity, like getting the Wi-Fi password for the studio in which you’re working. First things first, right? How on earth can we start writing a song before we know the Wi-Fi password? Oh…something else to consider: a universal database. Check out: auddly. It’s a song data management platform that’s set up to collect information and files, all in one safe place. I like it. Plus, their website is sooo pretty. Thanks as always, for reading. 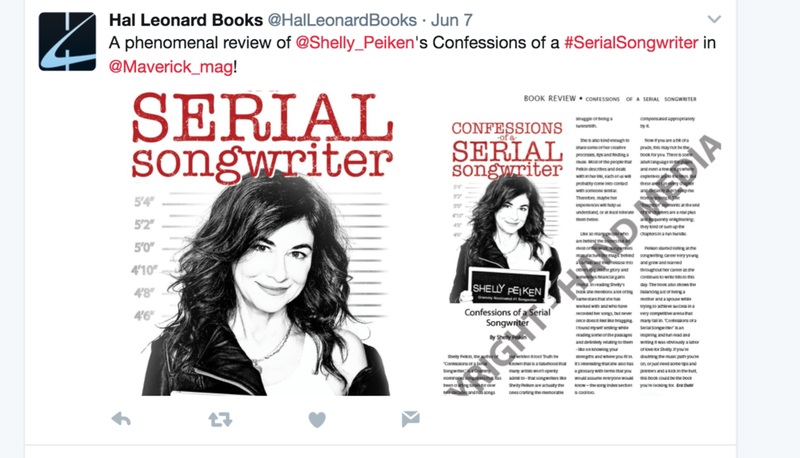 Confessions of a Serial Songwriter is now available as an audio book, narrated by me! Get your first book free on Audible! Sign up for this Blog! Find me on my Serial Songwriter Facebook Page, or Twitter or Instagram. Check out my whole website.